Home Apps Android Apps/Games MAZEY – Mazey is a game all about making your own fun. MAZEY – Mazey is a game all about making your own fun. 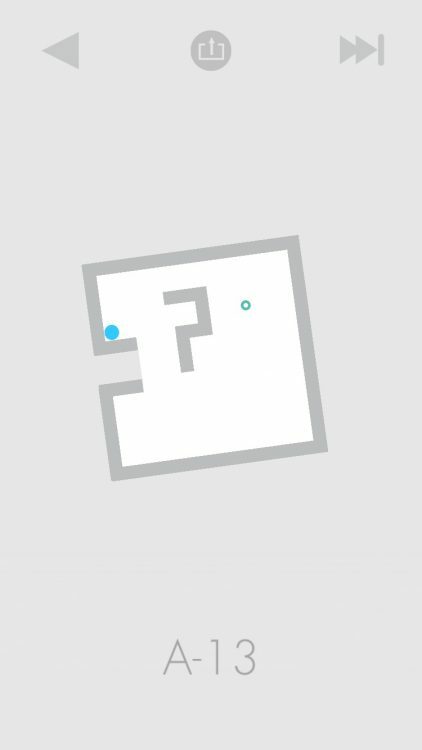 A minimalistic puzzle game with tiny mazes to solve through rotation. Immediately reminiscent of a game from years gone by, Mazey keeps it immensely simple. That’s not an insult either. It knows exactly what it’s meant to be and doesn’t deviate. Think of it as a (mostly) calming distraction from life rather than something that you’re going to be devoting a significant portion of your time to. In that way, it’s a decent bite sized companion to a more heavyweight gaming collection. Each level offers one very simple objective – get the ball to the opening in order to move onto the next stage. This is done by tapping on either side of the screen to tilt the maze around. Unusually, there are no tilt controls here. You’re restricted to tapping on the screen rather than moving your iPhone around, but that’s to your advantage. Mazey requires some fairly accurate tweaks and I’m not convinced physically moving things would be easy to do. Early stages ease you in very gently. You can easily make your way to the switch to activate the opening before moving towards it. No precision is really needed, as you can just wildly move around. It’s perfect for honing your skills for later on. Where things get harder is when you’re introduced to perilous red ‘things’. Red balls can collect en masse, with a mere touch wiping you out and forcing you to restart. There are red spikes too, with you again having to restart if you clash with them. Restarting can be done near instantly but who wants that tiny glimmer of failure hitting you in the face? Exactly. It can be tricky to line things up just so. Occasionally, frustratingly so. While early levels allowed for you to wildly leap around, soon enough, precise touches are essential if you want any chance of getting to the end of a level. Things get even harder when you realise that, technically, you want to do more than just get to the end too. Each level offers 3 blue dots that can be collected up. You don’t earn anything for doing so. There are no prizes other than satisfaction in Mazey, but that satisfaction can feel pretty good. By collecting all three dots, you’ll feel the smug joy of having done things ‘right’, along with getting to see it highlighted on the level select screen. Essentially, Mazey is a game all about making your own fun. There are no power-ups, no timer to track how fast you complete a stage, or anything like that. This is just the pure glory of completing a level that was taxing you previously. That means it stands out from most other entries in the App Store, being distinctly simplistic yet entertaining. If you’re looking for something with glitz and glamor, Mazey isn’t it. It’s very much like a game that we saw at the inception of the App Store, but it’s a well made example of how such a simple concept can be so much fun. Each maze is well constructed ensuring it’ll tax you but it’ll never be cheap in its design. Such simplicity means it’s a kind of breath of fresh air in a world full of games trying a little too hard to overwhelm your senses. Mazey knows what it is and doesn’t deviate from the plan. Adrenaline junkies need not apply, but it’ll still confound you for a while to come, but in the good way.